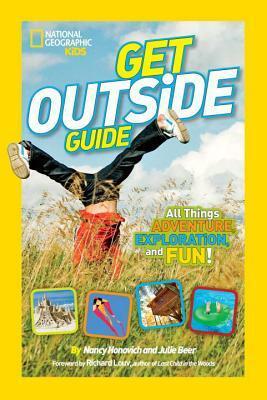 Title : National Geographic Kids Get Outside Guide: All Things Adventure, Exploration, and Fun! This fun-filled guide inspires kids to get out of the house and explore the great outdoors where they can discover the wonder and amazement of the world around them, whether in their backyard, across the country, or around the world. Full of fun activities, kids will learn how to make backyard bird baths, explore their local state parks, participate in an outdoor communityThis fun-filled guide inspires kids to get out of the house and explore the great outdoors where they can discover the wonder and amazement of the world around them, whether in their backyard, across the country, or around the world. Full of fun activities, kids will learn how to make backyard bird baths, explore their local state parks, participate in an outdoor community event, and much more. Activities for every season, spring, summer, winter, and fall will be included to keep kids engaged all throughout the year. And some rainy day activities will also be presented. Fun facts, lists, and sidebars supplement activities to help put information into geographic, scientific, and/or historical context, to help kids dig deeper and learn more. Great craft ideas and I love the focus on different areas, from water and wetlands to city parks. The best state parks guide in the back is extremely helpful too. A lot of great ideas for our family this summer. Read this book, then put it down and explore The Great Outdoors! Great book for families! Packed with fun facts and activities that will get kids outside and exploring this summer.